Scott Smoot: I’m director of the Middle School’s W.arts (“Walker Arts”) Drama Team, here at a virtual round table with my colleagues responsible for music, dance, and art work for W.arts’ production of Legally Blonde the Musical, Jr. At two performances October 2 and 3, audiences packed our auditorium and cheered the show, giving our kids immense satisfaction and happy memories for a lifetime. But we say at Walker that we “value the experience above the applause,” and we’d like to share something of fifty hours’ experience that went into a performance of just over one hour. Let’s take a slice, less than five minutes, to show you how a musical works. The portion I have in mind begins at an emotional low point of the story involving the young heroine “Elle” (sixth grader Hannah Bachman) and “Warner” (seventh grader Robbie Hedden), the young man she expects to marry. At a fancy restaurant, flanked by a chorus of waiters, he has just told her in song that she isn’t “Serious” enough for him, a future senator on his way to Harvard Law School. She storms out, and Warner ruefully says, “Check, please.” Blackout on the restaurant, house right; lights up stage center on a banner that sets the scene as “Elle’s” bedroom in the Delta Nu sorority house. Two hours’ work went just into that transition. That’s how long eighth grader Michael Johnson and seventh grader Jeff Murchison aimed lights and programmed the dimmer board to create four distinct areas on the auditorium’s floor and stage. Thanks to their work, the story moved along without a pause, fading on a scene in one area and and lighting up the next. Wendy, you were our stage manager. What was happening behind the scenes at that moment? Wendy Hawk: Those “waiters” dropped their linens on the props table and changed costumes right there in the stairway to become frat boys and a Harvard dean. They had only four lines of dialogue and three verses of a song to change. 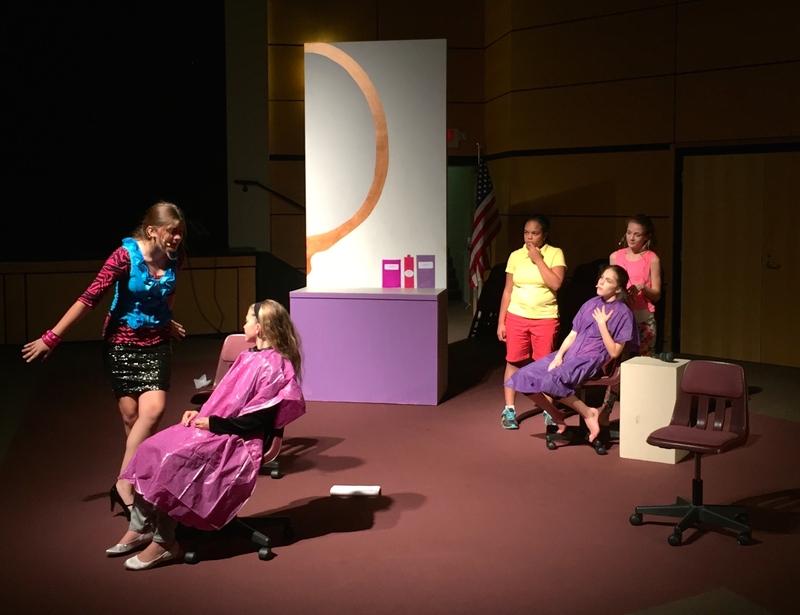 Meanwhile, on her way to center stage, Hannah grabbed a pink bathrobe planted before the show by sixth grader Brooke Baughan, who managed Hannah’s transitions from scene to scene. Scott: The robe’s pockets were stuffed with candy wrappers to show that “Elle” has binged on candy for days. When I told my 7th grade English classes that we had to consume dozens of Milky Ways, they were willing to help for the sake of the show. Regena, we haven’t even mentioned the other costumes. Art Director Regena Simpson: The Delta Nu girls, all sixth graders, wore matching tee shirts. We’d tried brushing on sparkly “Delta Nu” symbols with fabric paint, but the insignia didn’t stand out enough. So we cut the Greek letters from sheets of felt and glued them to each shirt. That took hours, but the effect was worth it. We had the process down in time to do different shirts for the frat boys. Scott: So, in our five minute slice of the show, we’ve advanced about fifteen seconds. Talking to her sorority sisters, “Elle” gets the idea that she can show “Warner” how “serious” she is if she just gets into Harvard Law School. Choral Director Samantha Walker: That’s my cue. It was a tricky moment. Jeff in the tech booth started the recorded track. Hannah timed her spoken lines around three chords and then launched into a song, “What You Want,” stepping into new light, house center. Wendy: We choreographed that dance with the girls in a line confronting the boys, pushing them away from “Elle”. Only we were short on boys. Then Sam had a great idea to invite her Upper School men’s a cappella group to join in. Samantha: They were excited to do this. Most of them had been in W.arts musicals during Middle School. We learned the song in about half an hour, and they showed up for rehearsals in the last week of the show. Regena: The boys’ lead singer (seventh grader Spencer Duncan) was great with six guys backing him up, some of them twice his size. The cool thing about that was how wonderful it was to have the Upper School boys step in to help the Middle School’s musical. Scott: Staging the next transition was a tough one for me to figure out, until I was inspired by a Middle School pep rally. I thought, “That’s what we need!” when the team burst through the “Wolverine” banner. “Elle” and her friends make references to cheerleading in the script, so it’s natural that pep rallies would inform our thinking about design and movement. Regena: So Wendy and I painted this giant “Delta Nu” sign on a giant roll of banner paper, then on a separate matching size paper, we painted the Harvard seal in gold . We taped the two banners back-to-back. Regena: –which is why we had to paint everything twice. That took about eight hours for an effect that lasted one second. Scott: Ah, the magic of musical theatre! Samantha: Although we learned the song in August, it was hard for the kids to remember their parts with all this activity, so we were re-learning right up to the last week. Scott: Song over, wild applause received, Jeff cued traveling music, Michael shifted the lights, and actors dressed as Harvard students revolved a wagon that was painted to look like bookshelves and a chalkboard by Wendy, Regena, and volunteers from our parent booster club POTA (Patrons of the Arts). Every individual involved put about five hours into these five minutes that cover half a year of “Elle’s” story. We worked hard together to create something original: that’s my definition of “fun.” Thank you, ladies, students, and parents! Legally Blonde the musical, Jr. has music and lyrics by Laurence O’Keefe and Nell Benjamin with book by Heather Hach, based on the novel by Amanda Brown and the Metro-Goldwyn-Mayer motion picture. Produced at The Walker School by special arrangement with Music Theatre International, Inc. (MTI). In our office, I am known as “Techno Bobby.” This is neither a compliment nor a resounding endorsement of my technological skills and knowledge, but rather a lack thereof. For me to offer insight or wisdom about social media is comparable to me writing about knitting – I have little experience with one and none with the other. However, I did have three takeaways from our recent “Public and Permanent” assembly and parent program on social media presented by Richard Guerry from The Institute for Responsible Online and Cell-Phone Communication. What stood out to me after both presentations was how our children and students receive little preparation, information, or discussion on the power and possibilities of hand held technology. My third takeaway was no matter what we want to believe, our digital footprint prevents us from being truly “anonymous” regardless of what we are told or want to believe. There are ways for those we care about and those we do not know to see the technological decisions or choices we make. That very topic was part of a National Public Radio story the morning after Mr. Guerry was on campus. In both messages, emphasis was placed on the reality that is will become increasingly difficult for people to be “anonymous” in a technology driven world.